To install PowerServer Mobile/Web on the Unix\Linux platform, you will go through the same installation process as that used for the Windows platform. The only difference is, with the Unix\Linux platform, you will complete the installation process in command line mode, instead of using graphical user interfaces. If you copy the Appeon setup program to the computer before installation, make sure that the directory does not contain special characters or spaces. When you input the command, please be aware that file names and directory names are case sensitive. The welcome message is displayed, which indicates that the installation process has started. 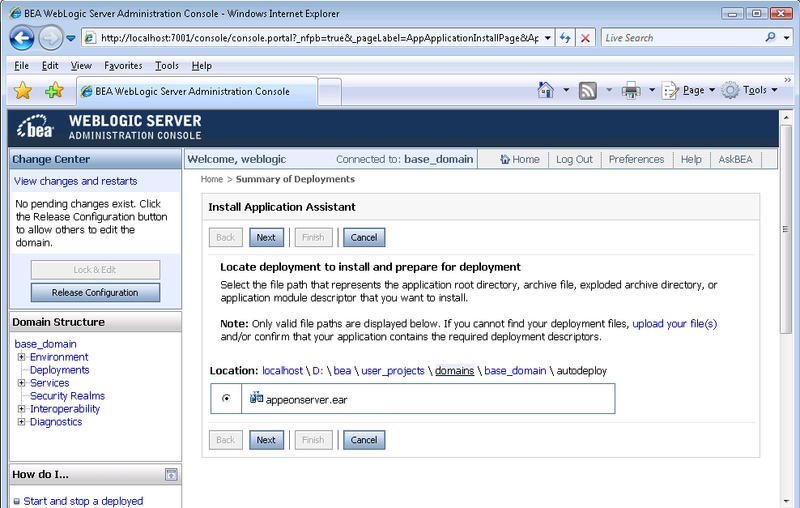 Follow the step-by-step prompts to install PowerServer. Welcome to PowerServer 2019 for WebLogic Server installation! Step 7: Specify the home directory of the WebLogic server as the PowerServer Mobile/Web installation directory, for example, /root/bea/weblogic92/. 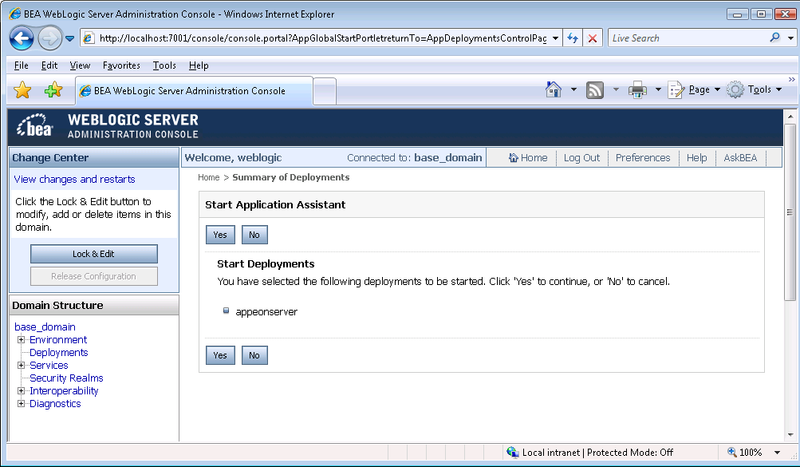 Step 8: Specify the WebLogic domain path where the PowerServer EAR package (appeonserver.ear) will be deployed. The product type is "PowerServer Web & Mobile"
The product key for PowerServer Web & Mobile is "XXXX-XXXX-XXXX-XXXX-XXXX-XXXX-XXXX"
The installation directory is "/home/AppServer/weblogic11g/wlserver"
The specified WebLogic domain home is "/home/AppServer/weblogic11g/user_projects/domains/base_domain"
The installer will start installing the files on your system. Go back if you want to change any settings for the installation. 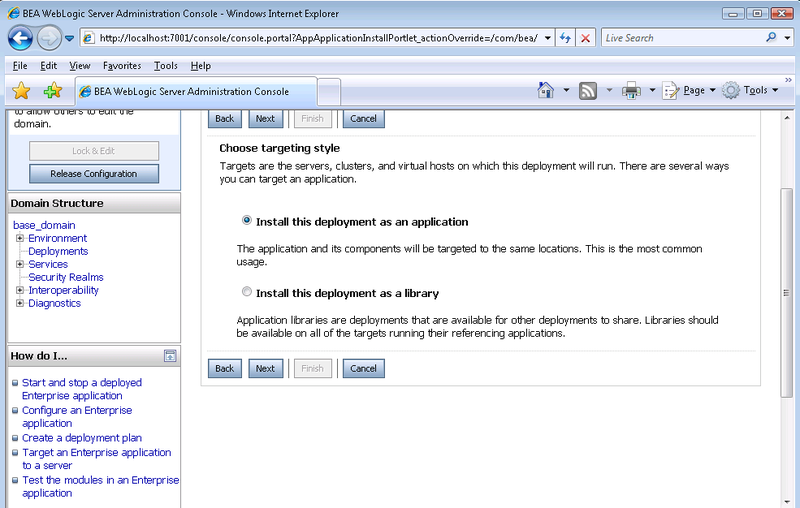 Step 10: When the installation is complete, choose whether to start PowerServer. Congratulations! The installation has been successfully completed. To start PowerServer immediately input y. To start it later input n. Refer to Starting/Stopping PowerServer for how to manually start PowerServer using commands. 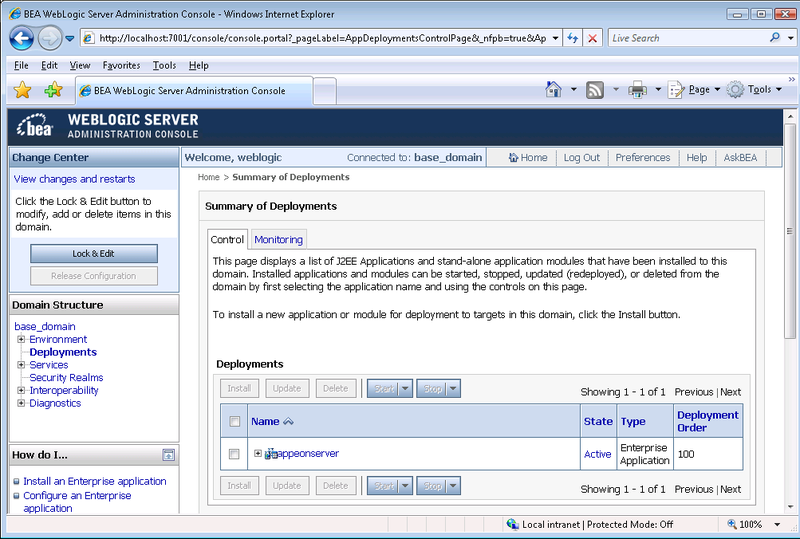 Skip this section if WebLogic Server runs in the Development mode because WebLogic Server in Development mode includes an auto-deployment feature which can detect the PowerServer EAR package (appeonserver.ear) and automatically deploy it. In this case, you can verify that PowerServer was successfully installed and deployed by starting WebLogic Server and then accessing AEM via http://localhost:7001/AEM on the local machine. Step 1: Start WebLogic Server. Open the $BEA_HOME/user_projects/domains/mydomain/bin/ folder and run the startWebLogic.sh file. For details on starting WebLogic Server, refer to Starting/Stopping PowerServer. 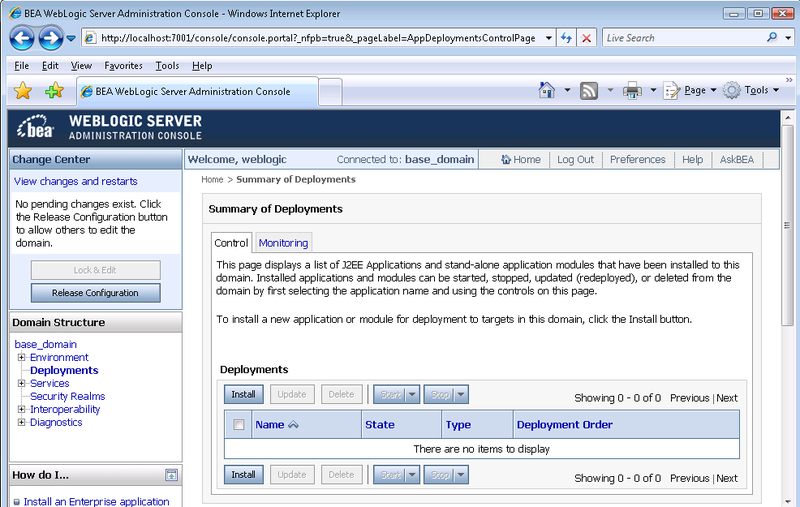 Step 2: Access WebLogic Server Administration Console via http://localhost:7001/console on the local machine. The WebLogic Login window will appear. 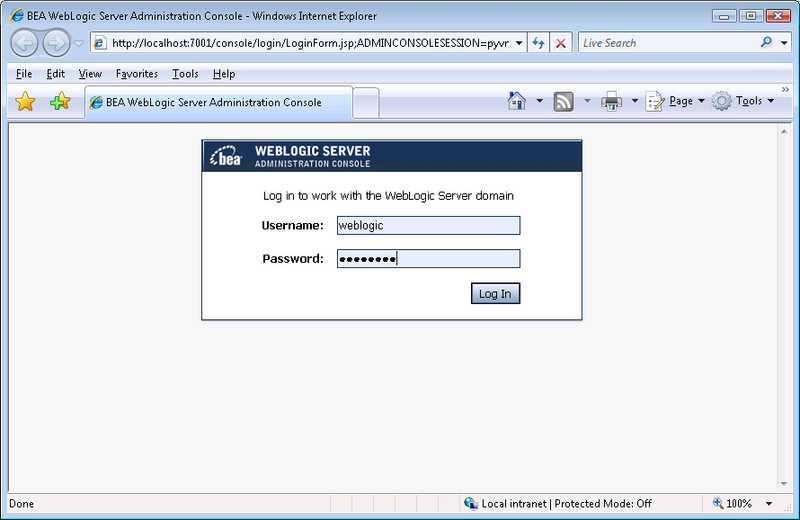 Step 3: Log in to the WebLogic console with the correct username and password. 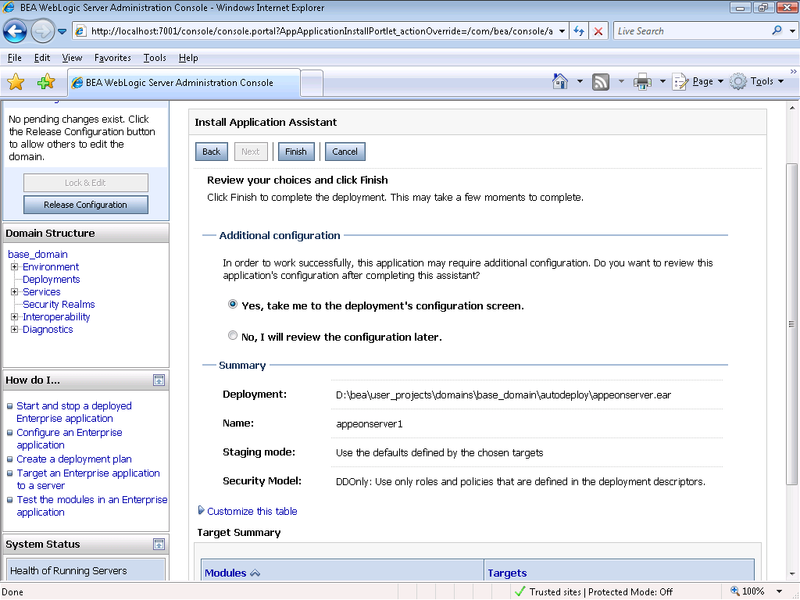 Step 4: Click the Deployments node and click Lock & Edit in the left pane, and then click Install in the right pane. If you are using WebLogic 8, the appeonserver.ear resides in $BEA_HOME/user_projects/domains/mydomain/applications. 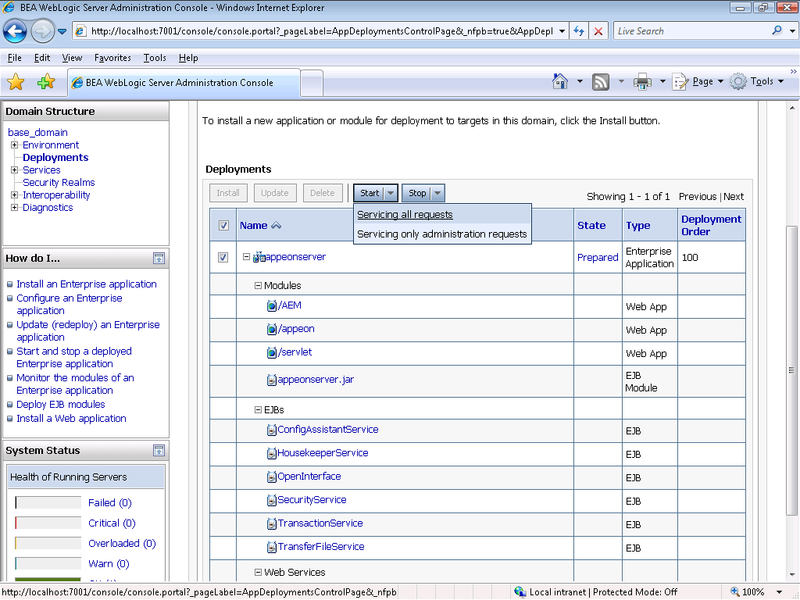 If you are using WebLogic 9/10, the appeonserver.ear resides in $BEA_HOME/user_projects/domains/mydomain/autodeploy. 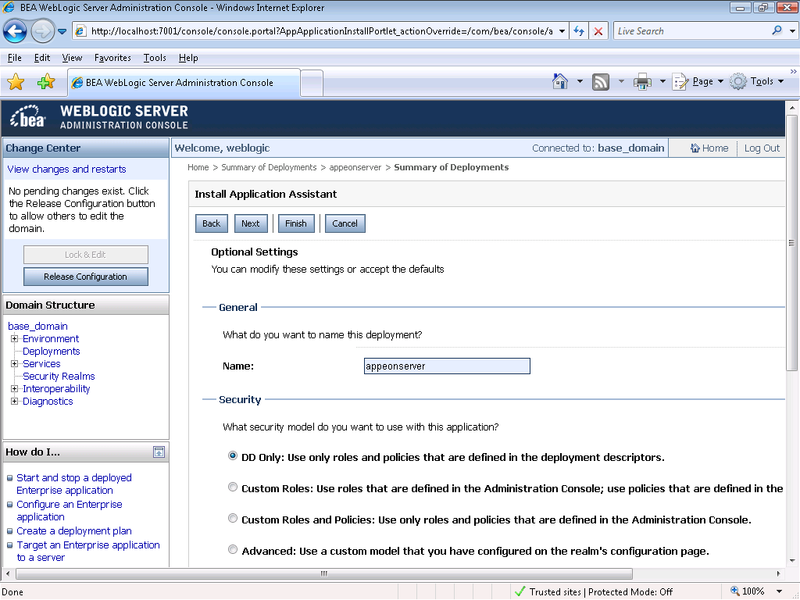 Step 8: Review and check the summary of settings you have chosen, select No, I will review the configuration later, and then click Finish, the Deployment page appears with the installed appeonserver.ear being displayed in the Deployments table. 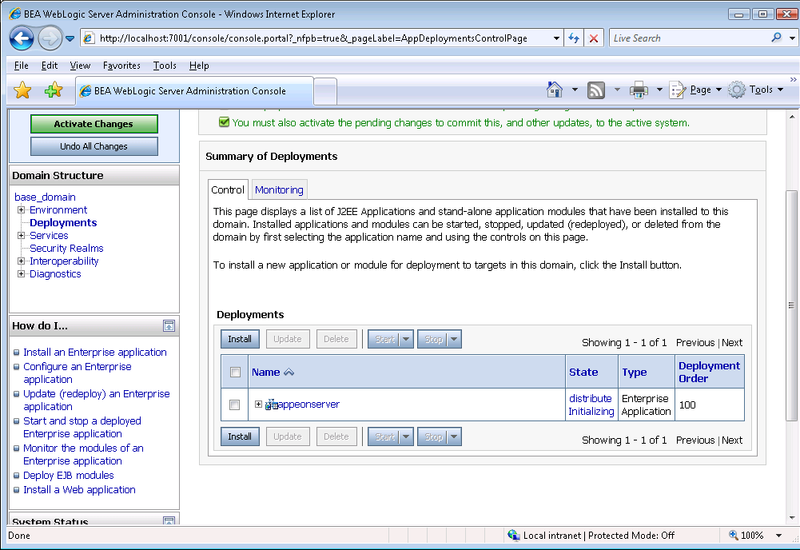 Step 9: Click Activate Changes in the left pane to commit your pending changes to the server. Step 12: Access AEM via http://localhost:7001/AEM.